The Senate Finance Committee passed a version of the Tax Cuts and Jobs Act last week, which now heads to the full Senate floor for a vote. Some claim that the bill leaves behind small and pass-through businesses, that it doesn’t give them enough of a tax cut when compared to bigger corporations. Under the Senate plan, bigger traditional “C corporations”—think Home Depot, Walmart, or Disney—would see a 15 percentage point reduction in their tax rate, from 35 percent to 20 percent. Most businesses in America are not, however, big C corporations. They are smaller and often privately owned businesses, and they pay their taxes as individuals, at the same tax rates as you and I. Under the Senate plan, these “pass-through” businesses would also get a rate cut. The top marginal rate for business income would be reduced from 43.4 percent (39.6 percent, plus the 3.8 percent Obamacare investment tax) to 42.3 percent. The Senate plan also offers a 17.4 percent deduction to most small businesses, which would lower the effective rate to 34.9 percent. At first, this looks unfair. A 20 percent tax rate for C corporations is much lower than the 34.9 percent for small businesses. But just as magicians overcomplicate simple tricks in order to obscure the truth, our tax code is overly complicated and obscures the true tax rates. As an investor in a C corporation, the return on my investment is not just taxed as corporate income—it’s taxed a second time at a rate as high as 23.8 percent when I receive a dividend payment or sell my stock and realize a capital gain. Don’t be fooled. The total effective rate on C corporations under the Senate plan would actually be 39 percent, not 20 percent. The 39 percent rate faced by C corporations is actually higher than the 34.9 percent rate faced by most pass-throughs. This analysis disregards the fact that most pass-through businesses will be taxed at rates well below the top marginal rates described above. Around 86 percent of pass-through businesses are taxed at the new 24 percent rate, putting their effective tax rate after the deduction at 19.8 percent. That’s less than the proposed corporate tax rate, without the second layer of tax. Looking at just the number of businesses can be a bit misleading, however. A majority of the pass-through income is taxed at the highest rates. Thus, the top marginal rate still matters most to investment decisions and ultimately economic growth. 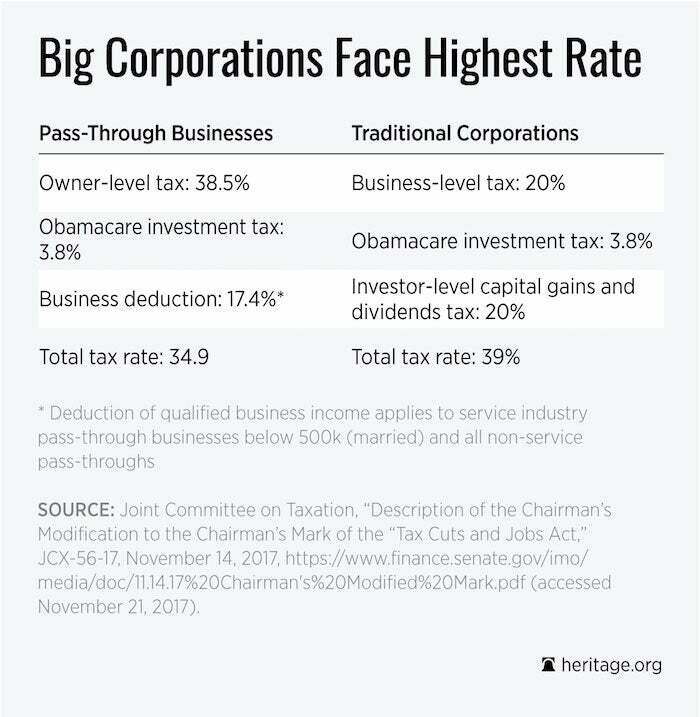 Under the current tax code, C corporations face a total effective tax rate of 50.5 percent (compared to the 43.4 percent pass-through rate). Traditional corporations are so tax disadvantaged that they have declined in number by 70 percent since 1980. Many traditional corporations have reorganized as pass-through businesses, which have grown in number by 180 percent over the same time. The Senate tax plan is certainly not perfect. The business deduction would not be available to certain high-income service industry providers, and tax rates would not be lowered as much as they could be to compensate for the elimination of the state and local tax deduction in many high-tax states. The Senate plan would, however, bring the two systems of business taxation closer to parity, when all layers of tax are accounted for. It would decrease the current inequity that favors pass-throughs and would work to lower the total tax burden for all businesses. None of this denies that businesses and many people will still face higher tax rates than they should, even under the proposed tax plan. Further reductions to all tax rates must remain a congressional priority in 2018 and beyond. For now, the Tax Cuts and Jobs Act provides significant relief for most businesses, big and small.